I guess I was busy in 2010. Its funny how I can’t quite remember doing much all year….but when I stick it all in a collage and have to leave 20 or so pictures out…I feel like I need a nap and a Dr. Pepper. Here’s to a maybe not-so-busy 2011! fabulous work! can't wait to see your new year projects! I agree with Dianne. Fabulous work! It's inspiring! I love reading your blog for inspiration – not only on beautiful design but also on getting stuff done!! What a beautiful assortment of quilts. I love them all. Now I feel inspired to get something done in 2011. Thanks for the little push to get going. wow – really beautiful quilts! It's amazing how we forget what we've done throughout the year until we put the pictures in a collage. Your work is amazing. Yeah. That is a lot. Cute cute quilts though! Happy New Year! Those are beautiful projects! Happy New Year! Plus you had the biggest project of all…a new baby! Best wishes for a wonderful 2011.
do you have a pattern or tutorial for the quilt that you put as the picture for your blog button? LOVE that! Your quits and projects inspire me and so many others. Thanks for sharing so much of yourself. Happy New Year! To Kristie's comment above, haha. Seriously. I would say this mosaic makes ME feel like a slacker (uh, it does, kinda…) but 2010 was a weird different year. Your blog has been amazing and creatively inspiring. So I'm taking some of that inspiration along with me into 2011. Thanks! That collage is so inspiring! I love it! So many awesome, amazing quilts. Makes me really want a close friend that loves making quilts and loves giving them to her close friend! I think one of my favorites of yours are the ones you made for your two sons' room – the raw edge circle quilt – just love the dimensional effect and the wonderful color/pattern. Someday, I tell myself, SOMEDAY! Um, you made all these lovlies AND gave birth! I feel like such a slacker. Such beautiful work! I can't wait to see what you do next year!! What a bright and cheery mosaic. I get such inspiration from your posts! What a beautiful riot of colour! What a fabulous collection for 2010.
you did a great deal of pretty making in 2010. congrats and happy new year! I am inspired! Making a resolution to start quilting in 2011! Great job! I have several of those patterns and one of my goals is to make them in 2011! Happy New Year. 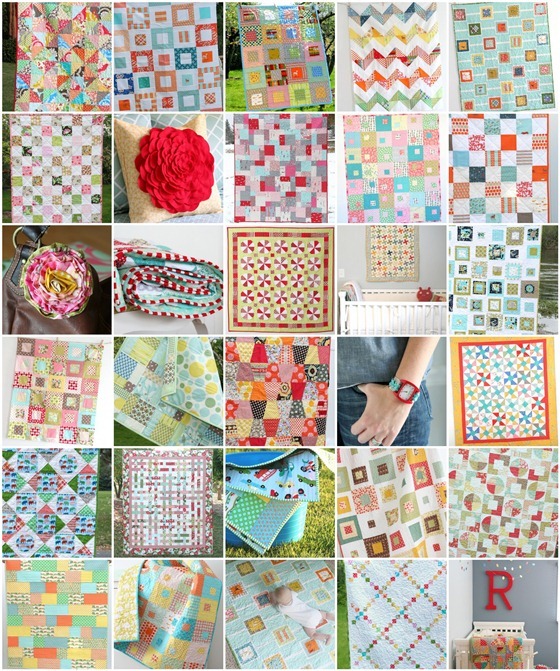 My husband would be so happy for me to make all those quilts, and I am semi retired! You are an inspiration to me, and my favorite websight. I look forward to your websight in 2011! What a wonderful year in review Allison! Now what would you do if you were cranking out those beautiful quilts that pop into your head? Hope your new year is everything you want it to be! Thank you too for teaching me soooo much!! :) And for giving me a heads up on your favorite quilt shop (Miller's Dry Goods) here in Ohio. It is an awesome shop and I was half tempted to ask them if they knew Allison! :) I'm sure they would have said yes! Wishing you and your family only the best in 2011! Wow, you were busy and productive in 2010! Just look at all those beautiful projects you created. So inspiring to see them in such a fabulous mosaic. Happy 2011 to you! Happy New Year and all the best wishes! lovely group of projects! I am a fan of your fall tumbler quilt… still double take when ever I see it. I am having a great giveaway for the New Year, let your followers know they can win a chance at at $15 gift cert from Shasta Quilts, an envelope full of fabric, ribbons, etc. Christian Tee Shirt, prayer book for moms & more! You amaze me, how you get so much accomplished! I look forward to your new projects this new year. Wow! You were crazy busy in 2010. I am patting myself on the back for finishing ONE quilt last year.